Teaming, partnership, and communication as keys to patient safety were among Dr. Tejal Gandhi’s top takeaways from the 18th Annual NPSF Patient Safety Congress held last month. 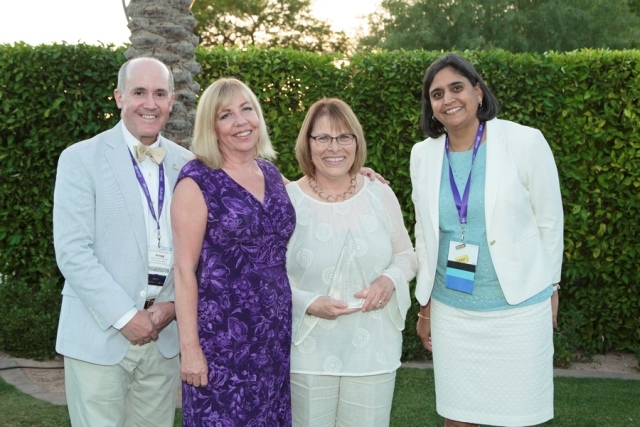 We were pleased to welcome all of you who joined us in Scottsdale for the 18th Annual NPSF Patient Safety Congress. In case you missed it, check out all of the tweets from this year’s Congress. The 19th Annual NPSF Congress will take place May 17-19, 2017, in Orlando, Florida. We want to hear from you. Please take our Congress survey by June 25 at midnight ET for a chance to win a $100 Amazon gift card. We truly value your feedback and review it carefully to make improvements to the program each year. NOTE: The deadline for requesting CE and CME credits is June 25. There will be no exceptions or deadline extensions. Requesting CE/CME is a two-step process that requires the completion of the sign-in form and also completing the online survey, which can be found on the sign-in form. Find out more. 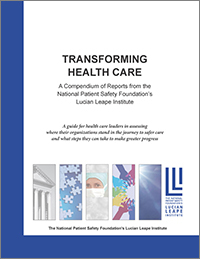 At the Congress, the NPSF Lucian Leape Institute released Transforming Health Care, a compendium of reports to guide the future advances in patient safety. Download the compendium. Find out from H&HN what leaders say about the Lucian Leape Institute’s compendium of reports. EngagingPatients.org’s John Q. Sherman Award, conferred by Taylor Healthcare and the NPSF Lucian Leape Institute, honored Iora Health and the Children’s Hospital of Philadelphia (CHOP) for excellence in patient engagement. Read more. The Stand Up for Patient Safety Management Awards recognized two member organizations, U.S. Naval Hospital, Guam, and Fairview Health Services for outstanding patient safety initiatives. Read more. The NPSF DAISY Award for Extraordinary Nurses honored one individual, Rachel Whittaker, BSN, RN, CPN of Children’s Hospital Colorado in Aurora, and one team, the Clinical Informatics Council of the University of New Mexico Hospitals in Albuquerque. Read more. Prior to the closing keynote with Kaveh Shojania, MD, Greg Meyer, MD, chair of the NPSF board of directors, announced this year’s poster awards. Read about those chosen for recognition. Congratulations to our 2016 Congress raffle winners. See who they are and what they won. Couldn't make it to Scottsdale? Sign up for our Virtual Keynote Series and earn continuing education credits at your desk. Find out who published results of a study on IV push medication preferences among critical care nurses. NPSF congratulates all who achieved the CPPS credential during the month of May 2016. Find out who they are. What does National Safety Month mean to you? Read about how the National Patient Safety Foundation encourages patients and families to ask the critical health care questions and get involved in their care. This webcast explains how the Patient Safety Evaluation System (PSES) can be used as a tool to help maximize integration and patient care. Want a discount on Professional Learning Series webcasts? Join one of our membership programs! Stand Up for Patient Safety member organizations receive complimentary registration for their teams. Members of the American Society of Professionals in Patient Safety (ASPPS) may register for their individual participation at the member rate of only $20. This course is open to experienced patient safety professionals who plan to take the Certified Professional in Patient Safety (CPPS) examination. This program is approved for six (6) contact hours toward the fulfillment of the requirements of CPPS recertification. Read details or register. Have questions about patient safety? Ask your peers on the NPSF online Forum. The Forum is an online feature where you can ask questions, share success stories or best practices, and keep up with your peers in patient safety. Anyone can read messages on the Forum. To post a question or to reply, you need to first register on the website. Learn more. The Agency for Healthcare Research and Quality (AHRQ) has a new online toolkit that aims to help hospitals and clinicians implement patient and family communication programs in cases of patient harm. The National Quality Forum (NFQ) and The Centers for Disease Control and Prevention (CDC) have released A Practical Playbook with systematic strategies and approaches for managing the use of antibiotics. What’s Alarming about Alarm Fatigue? Read a commentary from the AHRQ on safety hazards resulting from alarm fatigue. Take a look at the data on how using a Comprehensive Unit-Based Safety Program (CUSP) can help reduce catheter-associated urinary tract infections (CAUTIs). The study, funded by AHRQ, reports positive results from the program in US hospitals. Here’s a tool from the Office of the National Coordinator (ONC) for Health Information Technology. The playbook includes four chapters on patient portal implementation. Check out the Up and Away program on safe medicine storage at KnowYourDose.org. You can also join the conversation at #MedsUpAway and #Safe4Life. Holidays, graduations, weddings—as you consider your gifts, keep in mind that Amazon will donate a percentage of your total dollars spent to support NPSF and the patient safety mission. Use this link when shopping, https://smile.amazon.com/ch/36-7166993. And thank you!